This court battle is rapidly turning ugly and is splitting the family in half. The offense is led by his granddaughter, Rita Benson, who (until recently) was Vice Chairman of the Board of Directors of the Saints. In essence, she was Benson’s right-hand woman when it came to the Saints and was publicly acknowledged to be his successor-in-training. Along with her mother, Renee, and brother, Ryan, Rita filed a court action in Louisiana seeking a court determination that Tom Benson is incompetent to manage his own business affairs. Essentially, this lawsuit seeks the appointment of a conservator for the Saints owner. The defense is led by Benson’s third wife, Gayle Benson, age 67. She fully supports her husband of 10 years and says that not only is he mentally competent, but he makes his own decisions. She told the New York Times recently that she is with her husband 24 hours a day and that calls to him outside of the office go through her because Benson does not want to deal with a cell phone. Tom Benson was quick to point out in the same interview that Gayle “doesn’t ever try to overrule me.” Tom and Gayle Benson’s position is supported by Benson’s other granddaughter, the child of his previously-deceased son. The family is also battling in Texas probate court about whether Tom Benson is properly managing — or is even capable to manage — his late wife’s trust, which contains business interests worth many millions of dollars that will ultimately pass to Rita, Renee, and Ryan. Additionally, they are feuding over management of a series of irrevocable trusts that Benson created in 2009 and 2012 for Rita, Renee, and Ryan, which contain majority ownership interests in the Saints and Pelicans, among other valuable holdings. Why all this fighting? 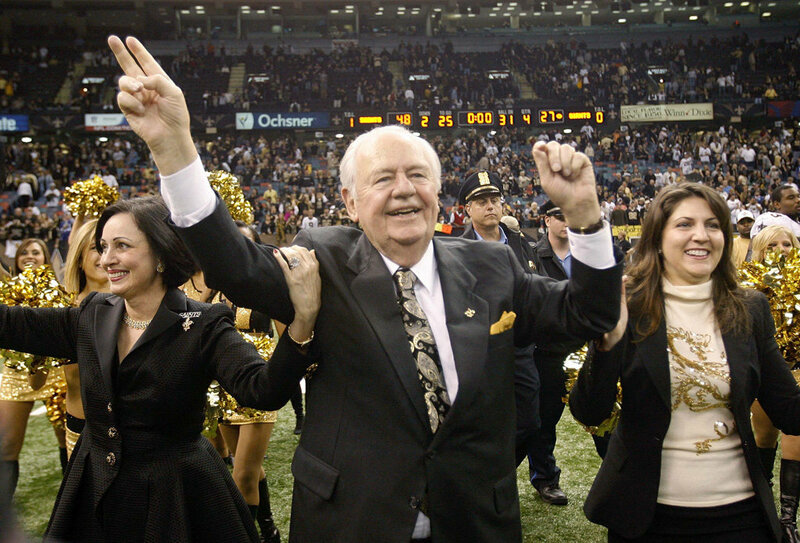 The breakdown became public just after Tom Benson sent a letter to his daughter and grandchildren informing them that he decided to leave controlling interest in the Saints and Pelicans to his wife, Gayle, and to lock his other heirs out from the teams. In the letter sent in late December, Benson chastised the three heirs, blaming them for causing drama and fighting in the family, concluded that he never wanted to see them again, and banned them from business operations. The decision was made just after Rita confronted Gayle before a recent Saints football game, which witnesses described as being ugly and included Rita grabbing Gayle by the shoulders and shaking her. This was not the first time that Benson reprimanded his granddaughter and future-owner-in-training. In 2012, Benson suspended Rita from team operations, placing her on administrative leave. The move was reported to be a planned wake-up call for Rita, because of her “lack of focus,” “abrasive management style,” and “sense of entitlement.” If Benson really felt that way about his hand-picked successor, then his anger is understandable, considering Benson is a self-made billionaire who likely disdains feelings of unearned entitlement. So what makes a fight of this nature more common than most people realize? The very same type of competency battles are common in blended families across the country, even when billions of dollars aren’t on the line. Just ask the families of Casey Kasem, Glenn Campbell, and Zsa Zsa Gabor what these fights are like. It’s typical for children from a prior marriage to disagree with — and feel excluded — when a later spouse (especially a younger one) seems to control access to the elderly individual. When that type of control is coupled with a dramatic change in the estate plan, fireworks are sure to follow — even if the fight is over two hundred-thousand dollars instead of almost two billion. 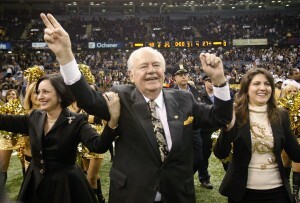 Is Tom Benson competent to make his own decisions … or is his wife pulling the strings? Is he making a suitable and reasoned decision to allow his wife to take over control of the Saints and Pelicans franchises instead of his hand-groomed successor? Is Gayle … who had two failed marriages and a failed business in her past before marrying Benson … really organizing a corporate coup, or does Benson have a legitimate basis to believe that she is the only family member capable of taking over after he is gone? The answer to these questions will come down to how mentally sharp Tom Benson really is and how much influence Gayle has over him. Those same questions arise in court battles of elderly family members on a daily basis. As in those thousands of other cases pending at any time across the country, the answer will primarily turn on how the person in question performs on evaluations administered by geriatric doctors. In this case, court-ordered competency assessments are scheduled for mid-March. The outcome of those tests will be critical. If Benson passes — as he and Gayle say he will — then Rita and the other heirs will likely have to go away without any say in future business matters. Not that all would be lost for them; they still will inherit many millions through the various trusts already set up. But the inheritances won’t include control of the sports franchises or other valuable business interests, if Tom Benson is found to be mentally competent. If he fails the testing, on the other hand, then that will likely lead to restoring his estate plan to its current version — updated as recently as 2012. Most likely, the mental evaluations won’t be 100% conclusive either way. The level of dementia and other forms of mental decline in seniors is not always clear-cut. A certain degree of forgetfulness and decline in functioning is expected and tolerated, without considering someone to be incompetent to make decisions. On the other hand, when the line is crossed so that decisions are being made in a manner different that the person would have made without the decline, the aggrieved heirs can often win a restoration of their interests. These court battles are often difficult, complicated, and expensive — but are unfortunately unavoidable in many cases where an elderly loved one is caught between two sides of the family. When millions or billions of dollars are on the line, it only makes the stress, costs, and emotions that much higher. Hopefully cooler heads can prevail upon the entire family to reach an out-of-court settlement and keep this ugly feud out of the courts. Resolutions achieved outside of the courtroom almost always make the most sense for feuding families, because no one really wins when the dispute proceeds to a full trial.